Recommended as a biologically active food supplement, an additional source of vitamins В5, В6, В12, biotin, zinc, amino acids (cystine and methionine). Those who feel the deficiency of vitamins and amino acids. 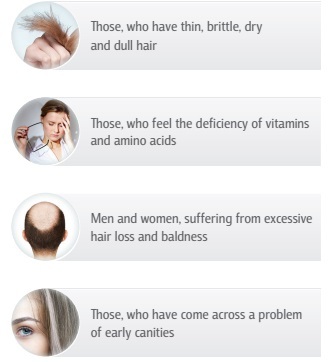 Prevents hair loss and premature canities. Cheviton food supplement contains amino acids—cystine and methionine that are vital for strengthening hair and nails.Methionine is not synthesized by our body, which means that its reserves have to be refilled from the external sources. Active ingredients of the complex penetrate directly into the hair follicles, effectively reduce hair loss and activate its growth. It is an ultimately complete formula with all substances, essential for beauty, growth and health of hair and nails. 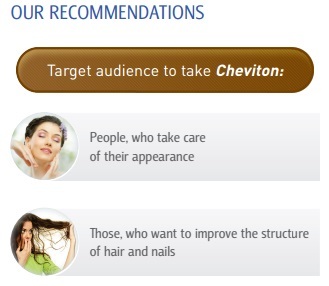 Cheviton is a perfectly balanced food supplement that stands for a true beauty-drugstore, helps keep manicure well groomed and a hairdo—worth of admiration.